This renovated kitchens large central island includes storage on both sides and casual seating. 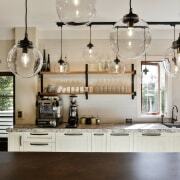 The pendants lights are a feature of the space, replacing inadequate lighting in the original kitchen. 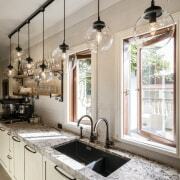 What does the idea of an Italian-style kitchen conjure up? Strong, honest materials? A degree of hand-worked elegance, perhaps? And is it also likely to reflect a driving passion for cooking? 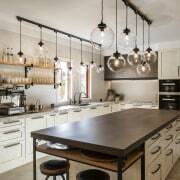 This transformed kitchen ticks all these boxes. 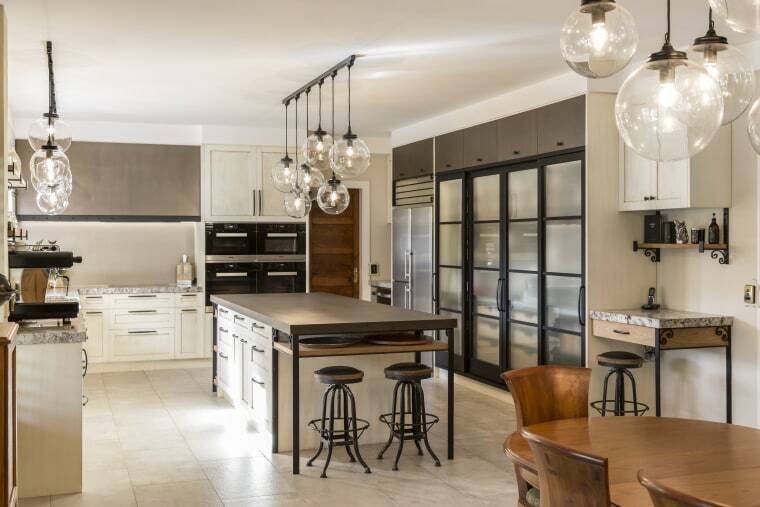 For the renovation, designer Shane George was asked to create a dramatic new kitchen in an authentically styled Italian country villa. "The existing kitchen lacked the functionality now required by the family, and it was also starting to show its age," he says. "I was asked for a more up-to-date look still sympathetic to the house style, but with added wow factor. "Plus, the owners regularly entertain large groups, so the kitchen had to have an excellent workflow almost semi-commercial in nature." 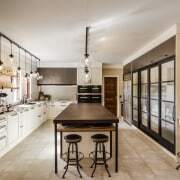 Feature pendant lights, wrought iron shelf brackets and even the metal cabinetry handles add to the rustic-meets semi-industrial flavour of this kitchen by designer Shane George. 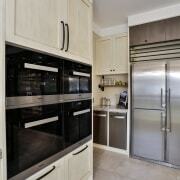 One challenge was creating the new kitchen within the footprint of the old one. And as the walls, floor and ceiling are solid masonry, new mechanical services had to be integrated into the back of the cabinetry. In terms of aesthetics and tying back to the home, Shane George emphasised an artisanal look. The cabinets are finished in a pearl lustre paint with textural over-brushing and the splashback is in bagged brick pattern tile. 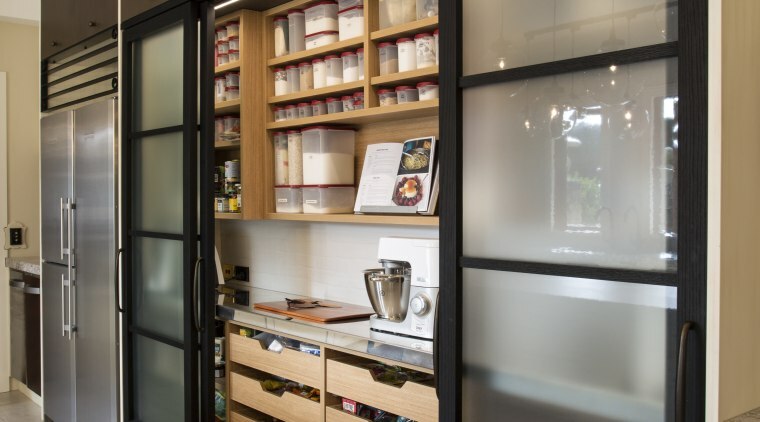 The large pantry is a focal point of the kitchen, with its opaque glass sliding doors and crafted wooden interior. The pantry door frames are in oak, with a black stain, complemented by the island's dark-toned, heat-proof engineered stone benchtop. The perimeter benches are honed granite. The industrial-meets-rustic feel is further extended by the wrought iron island frame and shelving brackets, and custom metal rangehood. In terms of functionality, the large island neatly divides the work zones. Underbench storage for plates and platters on one side of the island is directly across from the clean-up sink by the windows. The opposite side, next to the pantry, is for baking and muffin trays, as the pantry includes a dedicated baking centre. The pantry door frames and large flagstone-like floor tiles all contribute to the rustic-meets-commercial feel in this Italian-style kitchen. The timber door to the rear of the kitchen is the entry from the garage and so the two trash compactors are set in that area for convenience. 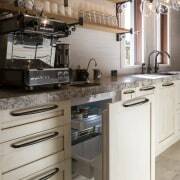 At the open end of the kitchen, near to the living spaces, there's a drinks station on one side and a casual writing desk, also in granite, on the other. 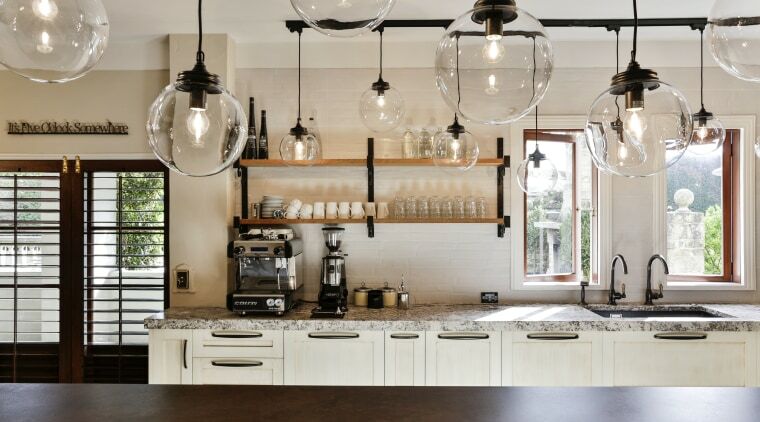 Besides the rustic Italian and semi-industrial touches, much of the kitchen has a furniture-like appeal giving it a refined, cafe-style ambience that's perfect for entertaining.